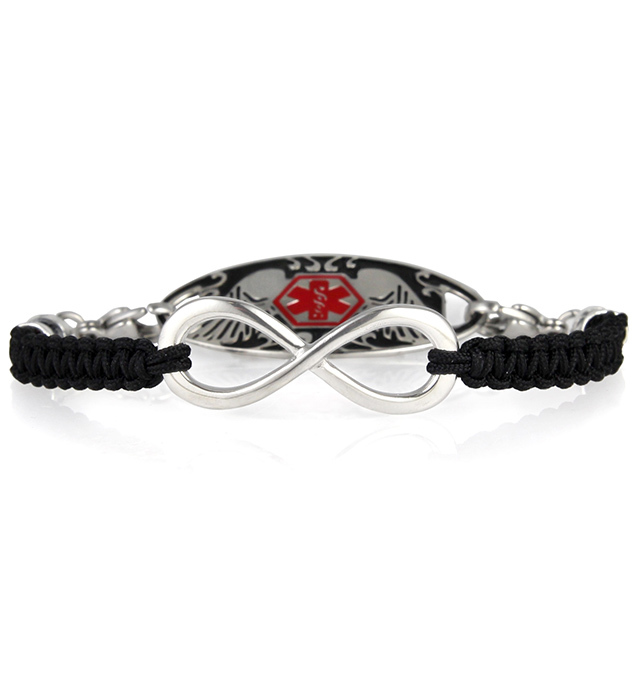 Our Infinite Beauty in Black Medical ID Bracelet features a stainless steel infinity symbol centerpiece on tightly woven black macramé. Pair this medical alert bracelet with any custom-engraved Lauren’s Hope medical ID tag. Infinite Beauty in Black is an interchangeable medical alert bracelet, which means you may simply open the two lobster clasps at either end to remove your medical ID tag, which you can then pair with any other Lauren’s Hope interchangeable medical alert bracelet. With just one medical ID tag, sometimes called a medical ID plaque or medallion, you can have countless medical alert bracelets to suit your mood, style, or activity. For example, you may wear a beaded medical ID bracelet most of the time but move your medical alert tag to a stainless steel medical ID strand for outdoor activities. Whether you or your loved ones wear medical alert jewelry for breast cancer; penicillin, sulfa, or other drug allergies; Alzheimer’s or dementia; heart conditions such as arrhythmia or atrial fibrillation; or any chronic medical condition, interchangeable medical ID bracelets are an excellent option for those seeking customization, flexibility, and style.